Auto Finesse Citrus Power is a wax and sealant safe pre-wash and exterior all purpose cleaner, perfect for those times when regular shampoo and snow foams just aren’t enough. Unlike most exterior APC’s and traffic film removers, Citrus Power is gentle enough for regular use on your wax or sealant, but tough enough to tackle even the worst winter grime. Whether we’re washing off the bug splatter from a long road trip, prepping the trims of a daily driver for dressing of Revive or Dressle, or cleaning grease and oil from the engine bay of a priceless supercar, Auto Finesse Citrus Power is the product we always reach for. Auto Finesse Citrus Power is not just a safe citrus pre-wash for dissolving tough debris that washing alone cannot remove. It’s also one of the best exterior all purpose cleaners we’ve ever used! Citrus Power’s gentle nature makes it the only APC we would use for sensitive applications, like degreasing motorcycle engines, or cleaning the lacquered door jambs and enameled badges of classic cars. Whether you need a wax-friendly pre-wash, or a powerful exterior all purpose cleaner, Auto Finesse Citrus Power is the detailing product that you can always rely on to get the job done! 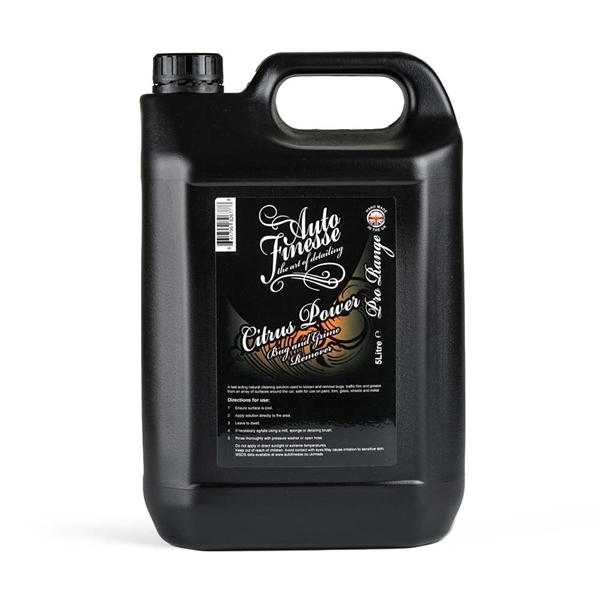 Like all Auto Finesse car care products, Citrus Power is formulated to suit the needs of professional detailers, but can be used with great success by detailing enthusiasts and first time detailers as well. When we were developing Citrus Power, we were just looking for a simple wax and sealant safe pre-wash. We wanted something that could effectively break down winter salt spray, bugs, traffic films, mud splatter, and bird droppings without the risks of caustic traffic film removers. Citrus Power lived up to our highest expectations, but in the process of testing, we found it could do so much more. Bug Splatter and Road Grime Through out the year a daily driver can become covered with different bug splatter and road grime, and can often be hard to remove once dried. This causes issues on the wash process and can lead to people scrubbing hard on the paint to remove the baked on splatter and grime, intern this can create marring and swirls on the surface. Citrus power eliminates this. Simply spray the Citrus Power onto the area and allow dwelling whilst Citrus Power does all the work for you. Then remove the splatter with fresh water, be it from a garden hose or pressure washer. Lower Body Panels Areas on the lower half of a vehicle often collect the most dirt on the car and can be the cause of swirl marks. Places such as sills, wings and be hind the front wheels often become the dirtiest from road grime, road salts, grease and brake dust. By adding Citrus Power into your wash routine as a prewash you can remove a lot of this dirt before you take a wash mitt or sponge to your paint work. Spray Citrus Power on the lower half of your car before the wash stage, and allow dwelling for five to ten minutes before rinsing off. Wheels, Tires and Wheel Arches Often the use of a heavy wheel cleaner is not always needed to produce the finish desired, especially when wheels have been previously waxed with a wheel wax such as Mint Rims. Spray the wheel and tire in Citrus Power and allow dwelling. If needed, agitate the dirty wheel and tire to release any trapped in dirt. Once agitated, rinse the dirt away with fresh water. This process also works well with wheel arches. Engine Bays Engine bays can be a worrying area for many when it comes to detailing. Citrus Power makes light work engines bays, new and old. The cleaning agents in Citrus power break down all types of typical dirt, grease and oil found around the engine bay and is safe on painted parts, plastics and exposed metals. Often agitating is needed to release hard in dirt.